Traffic Rule playgrounds are set up by local council to help kids improve their bike, scooter or skate skills whilst learning all the road signals and rules. 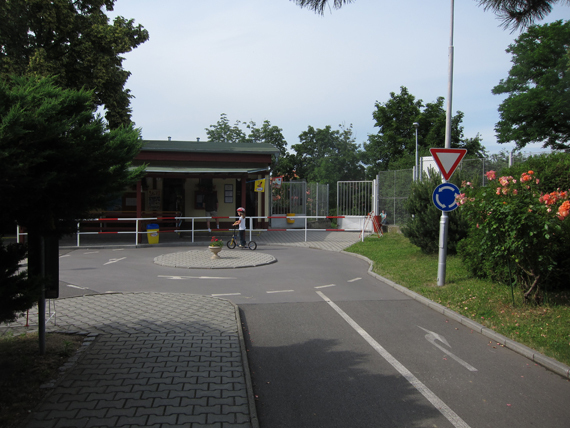 Karen has previously covered the amazing Traffic Playground in Prague 9 with it’s own petrol station and option to rent motorised cars plus another good one in Prague 6. I also know of ones in Prague 4, 7 and there is bound to be more - even in towns and villages - just search for DOPRAVNÍ HŘIŠTĚ in your local area. For me, it was my turn to check out our local version in Prague 3. 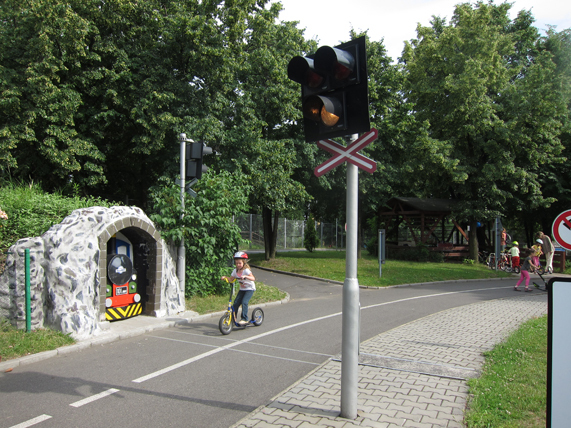 These fantastic playgrounds are quite common in the Czech Republic, having been implemented during Communist rule. 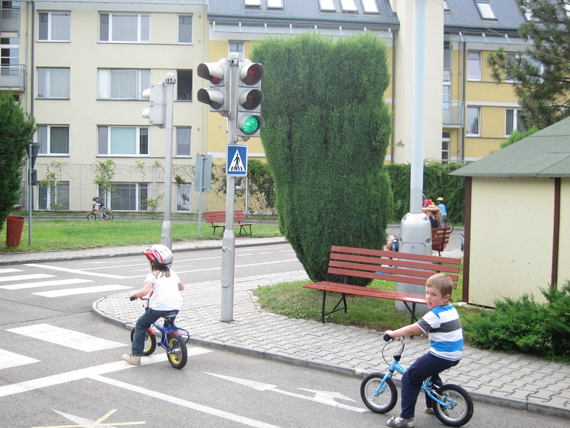 The playgrounds simulate roads, roundabouts, real traffic lights, railway and pedestrian crossings where kids can learn all the road rules and biking skills in a fenced and safe environment - far away from Prague’s notorious motorists! My daughter is about to turn 5 so we’re entering new territory as far as entertainment. Bikes and scooters are hugely popular with Lucie so the Traffic Playgrounds hit the spot perfectly. The best thing is they are so affordable. 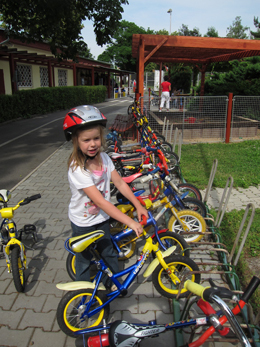 25czk per child buys you 1 hours entry plus countless bikes (including large scooters, balance bikes, bikes with training wheels) plus a helmet. On arrival you will be asked how many children and then on paying the fee you will receive a Bicycle Passport which shows the time that you have paid up to. On departure you hand the card in and if you’ve overstayed the hour you pay the difference - an easy 25czk for each additional hour. 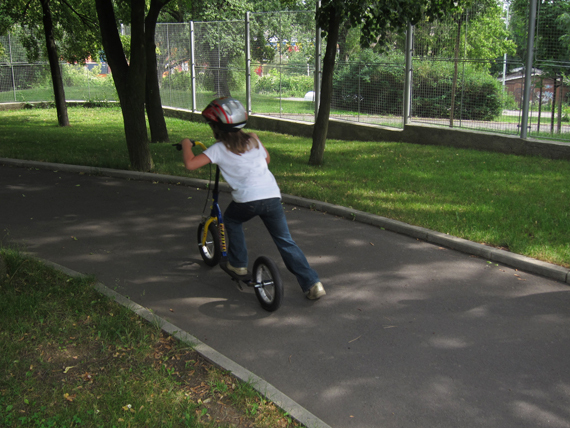 The general rule is that the playground vehicles are for children 4 and above, but I noticed younger kids on their own plastic push bikes (motorka), so I reckon kids around 2.5 to 3 could easily get away with it. 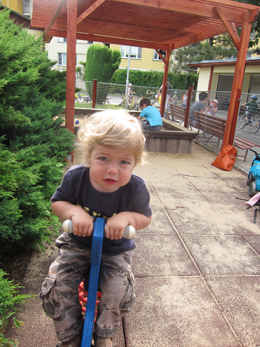 Ari is now 2 so still young for the cycle course but little ones are not forgotten, there was a rocking horse and large, covered sandpit with a good selection of toys for him and other young ones to play with. 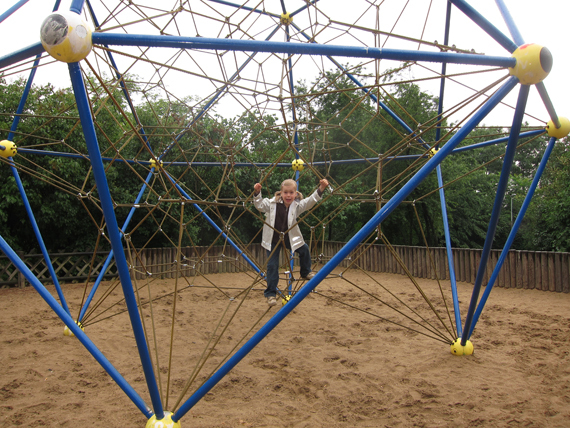 Just remember that the playground operates in the afternoon only - from 2pm, mornings are occupied by school groups. There is a limit of 25 kids on the course, but, I’m not convinced this is strongly adhered to. Also, Tuesdays is exclusively for Roller, In-line Skates and Skateboards. Another tip, check the bikes out personally. Lucie had one bike a moving seat which she found difficult to master - luckily the kids have a lot of choice when it comes to vehicles to choose from - it was a huge novelty for them to be able to change and try out all the different types. To my greatest surprise, towards the end of our stay Lucie chose a bike with pedals and no training wheels and with a little help managed to master her balance and the pedals and thus ride a bike solo for the first time - what a thrill! Lots of seating for parents and kids is available around the playground, in full sun or the shade. You are welcome to bring your own drinks and snacks, otherwise there is a kiosk selling icecream, hot and cold drinks and the usual snacks - sweet and savory. A great idea and one that seems very popular is a Party Hut that you can rent out for kids birthday parties, just hope you have a fine weather day - although it is a sheltered hut! 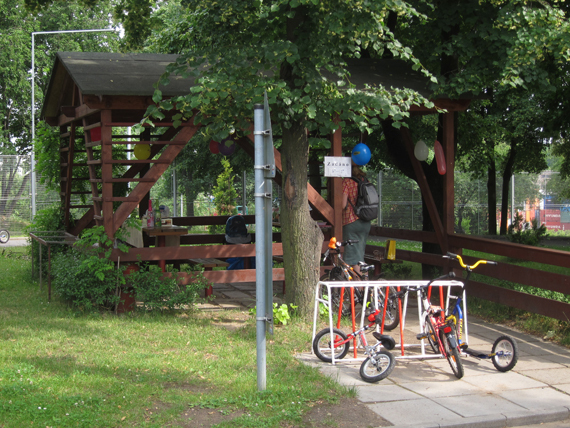 Also consider a walk around the park of Židovské Pece. It’s a very peaceful and quiet area of Prague surrounded by old Villas. Hidden within are two old-skool playgrounds, number 1 has swings, slide, roundabout, sandpit etc and number 2 holds one of the biggest climbing frames I’ve ever seen. Our afternoon out was a pleasure and I have to say very affordable. 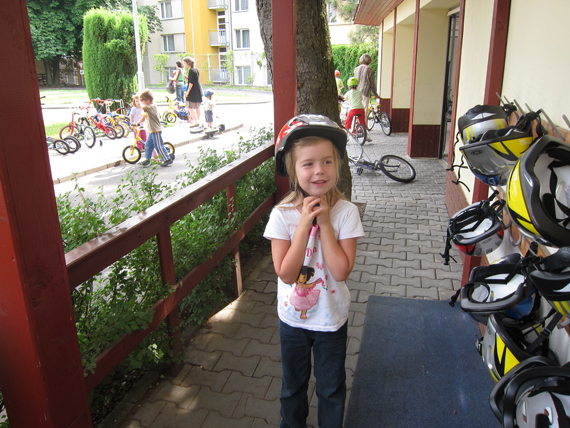 I had great pride in seeing my daughter finally master a bike and the kids had an icecream each - all up it cost us 45czk - that’s what I call value for money! COST: Entry: 25czk per hour includes helmet and bike or scooter rental, on skating day (Tuesdays) you pay 25czk an hour for skates, helmet and entry plus a further 25czk for elbow, wrist and knee pads. Parents and young kids not using the course are free. NB: Your own bikes, scooters and helmets can be used. Rollerblades, skates and skateboards are not permitted except on Tuesdays. If you bring your own transport you will still need to pay the 25czk entry fee. DIRECTIONS: By Tram: Take the 5, 9, 10, 16 or 19 to tram stop Biskupcova. The playground is a 5 minute walk. By Metro: The easiest is to take the green line A to Flora and catch the 5, 10 or 16 to Biskupcova. By Car: There is plenty of free parking in Malešická but please be very careful entering and exiting from your car as the street is quite busy and the verge for parking is close to the edge of the road.